Last November, Marisa, Kelly, and I took to the blog to talk about what TV items we were thankful for in 2014. 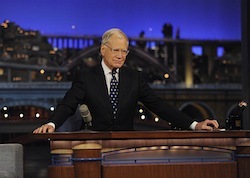 One of mine was David Letterman, and the way his retirement had brought about a renaissance of his whole Dave-ness. Since he announced his retirement a year ago, I’ve DVRd (and not missed) an episode, and it has been wonderful. There have been so many posts on the interwebs by seriously famous and funny people, and underlying most, if not all, of them is recognition that it’s just not going to be the same without Dave. So many people have shared about watching Dave for the first time, and how it changed their lives. I was born May 1st, 1980, and Dave started his morning show 50+ days later on June 23rd, 1980. So I didn’t see that; that didn’t change my life. My prime David Letterman years were when I was in high school and college, so mid-late 90s and early 00s.